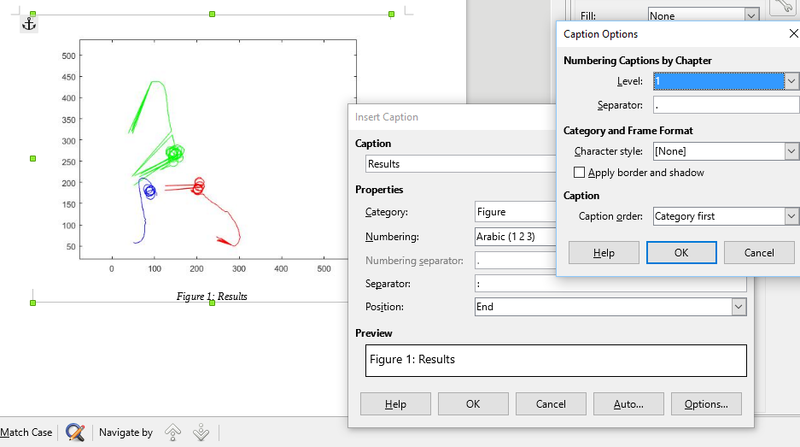 How to insert figure caption numbering according to headings numbering ? How can I make photo 1 caption (Figure 1.0) and photo 2 (Figure 1.1) photo 3 (Figure 2.0) photo 4 (Figure 2.1) ? I suppose you inserted your figure first by creating a frame (Insert>Frame>Frame...) and then added a caption with menu Insert>Caption ... after clicking inside the frame. The dialog which opens allows you to set many properties of the caption. 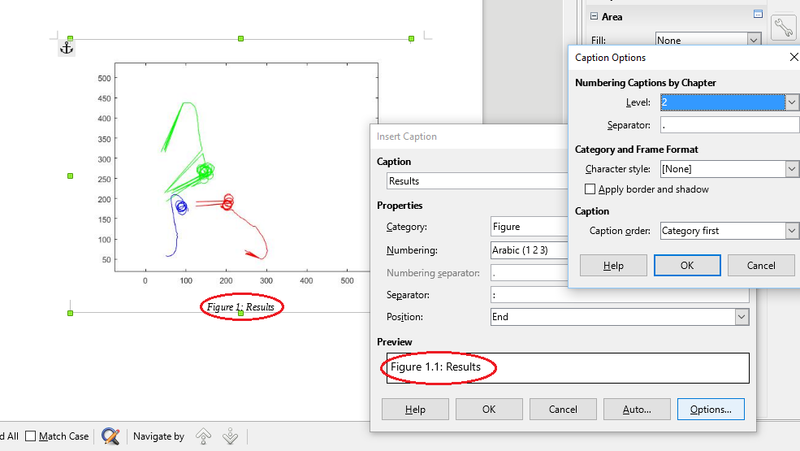 If the preview does not show something like Figure 1.1, click on the Options button. The first item in this second dialog is Numbering figures per chapter (or equivalent in your locale). The drop-down menu allows control on the number of levels displayed (from none up to 10). For chapter numbers only, choose Level: 1. Other options are rather for fancy text decoration and layout but you can experiment to your liking. Click OK twice and you're done. Chapter numbering in captions will work only if outline numbering is enabled. You enable it with Tools>Chapter numbering... and choosing a numbering style for the adequate Heading x paragraph style. If there is no numbering, chapter number is "void" and this "void" is transferred into the caption which gives a correctly numbered caption "void"-then-sequential-figure-number. With chapter numbering enabled, you get chpter-number/separator-/sequential-number. If your chapter one contains no figure, the first figure in chapter two is captioned 2.1 as expected. The most important comment is you are not using LO as it should be: there is a mixture of old-fashioned typewriter usage with modern document processing features. It looks like you are discovering /learning LO while you have a deadline with a professional task. LO is based on styles, the most important of which are paragraph styles. Their parameters (attributes) allow you to set all visual characteristics of the geometric area occupied by the paragraph: spacing above and under (must never be achieved with "carriage return" strokes), alignment with page break (again, not to be done with carriage returns because a simple text update will ruin your manual sync), first line indent (without the need for Tab character). Let's start with your text. It is styled Default Style; it should be Text Body. Default Style is the ancestor of all styles and should be used only to set globally shared attributes, usually only the font. Open the style navigator with F11. Right click Text Body and chose Modify.... Go to Indents & Spacing tab. Set First line indent to 1 cm, Spacing above and below to 0.3 cm (you may prefer some non symmetric values, experiment) and maybe Line spacing to Single instead of your 120%. Go to Alignment tab and set Options to Justified (it is usually better to justify paragraphs extending on the full width of the page). Click OK.
1/ In the latest LO release, menu Tools>Ouyline Numbering changed to Outline>Chapter Numbering. 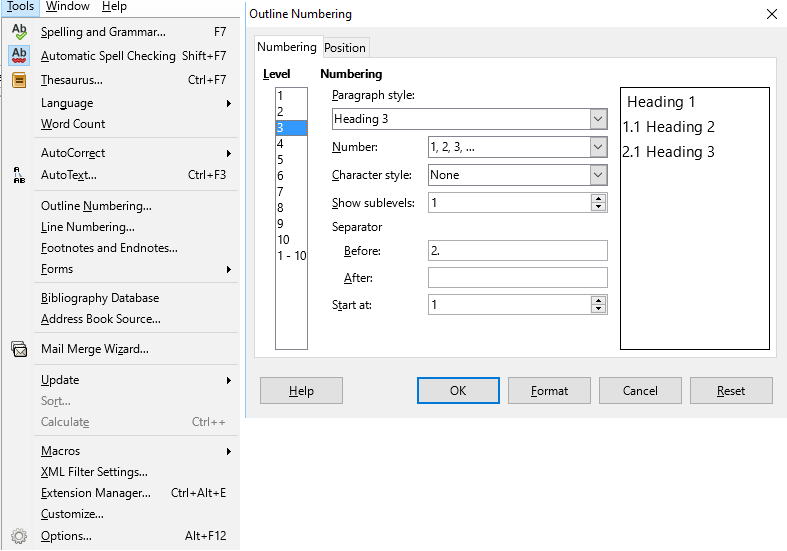 You are on the correct menu to enable chapter (=outline) numbering. 2/ Your settings are very strange: Heading 1 (usually chapter title style) is not numbered, hence no chapter number. I can't tell for Heading 2 (sub-chapter) and hope it has Show sublevels set at 2 without anything in Separator Before. Your Heading 3 (section in subchapter) is definitely buggy: sublevels set at 1 means you display no chapter nor subchapter (note this is a valid choice), but you force a constant 2. before the number with Separator before. 3/ Try to upload your file because I can't imagine what you've done with such a terse description. Preview is updated after OK on Caption Options because options are validated only after OK. In your snapshots, Preview is consistent with pre-existing options, i.e. "none" when you set "1", then "1" (as set by your first attempt) when you choose "2". The options do not update existing captions. To get your expected results, delete existing captions and insert new ones.